and numerous trace minerals that provide nourishment to the body. 20 to 50 milligrams of iodine. 1. 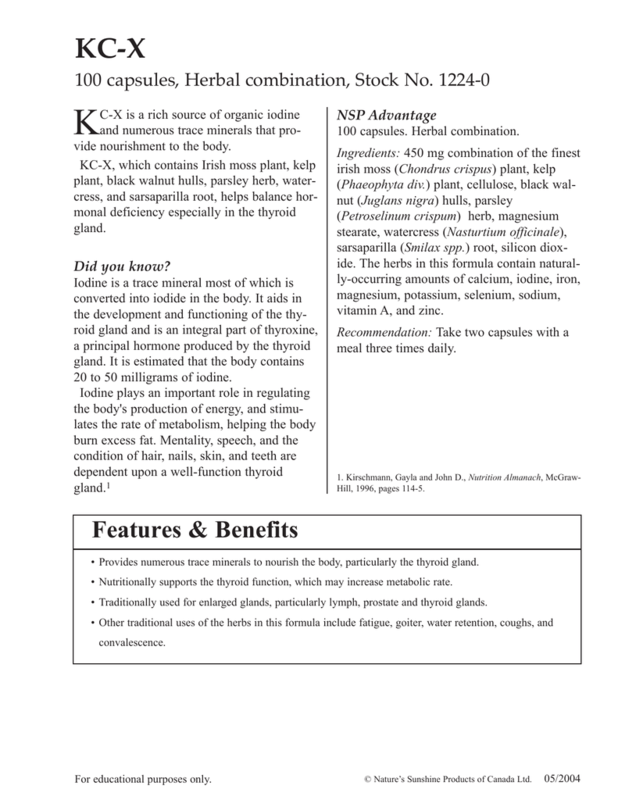 Kirschmann, Gayla and John D., Nutrition Almanach, McGrawHill, 1996, pages 114-5. • Provides numerous trace minerals to nourish the body, particularly the thyroid gland. • Nutritionally supports the thyroid function, which may increase metabolic rate. • Traditionally used for enlarged glands, particularly lymph, prostate and thyroid glands. © Nature’s Sunshine Products of Canada Ltd.
organiques qui nourrissent le corps. que le corps contient de 20 à 50 milligrammes d’iodure. • Fournit de nombreux oligo-éléments pour nourrir le corps, surtout la thyroïde. A des fins éducatives seulement.